As most of you know, I was on vacation the past two weeks. During that time I traveled over 3200 miles by car from Wisconsin, through Illinois, Kentucky, Indiana, Ohio, Pennsylvania, New York (where the speed limit is 65), Vermont, New Hampshire and Connecticut. I traveled by U.S. Highways as much as possible to get a better lay of the land. I’ll include an article on this trip in the next few days with some compelling photos and hopefully thoughtful observations and insights. I started writing this article on Monday, expecting to finish Tuesday. I’m sorry for being behind, I had to take care of a few clients who needed contacting. I also started working on a portfolio review for one of the “Margin of Safety Investing” members. If you are a paid member, remember to contact me about a free portfolio review. I normally charge $800 or more for this service. It’s free for founding members and I only have room for a few more this round. I’m going to be brief with the items I’ve outlined above. I’ll conclude with a list of things we need to be ready to do when the times come. During the summer, volatility drifted down, down, down with only a few whimpers of possibly raising its head. The ^VIX CBOE S&P 500 Volatility Index found its way under 10 for a few moments along the way. Tuesday, we saw volatility “soar” 20%. It’s been down and flattish since. 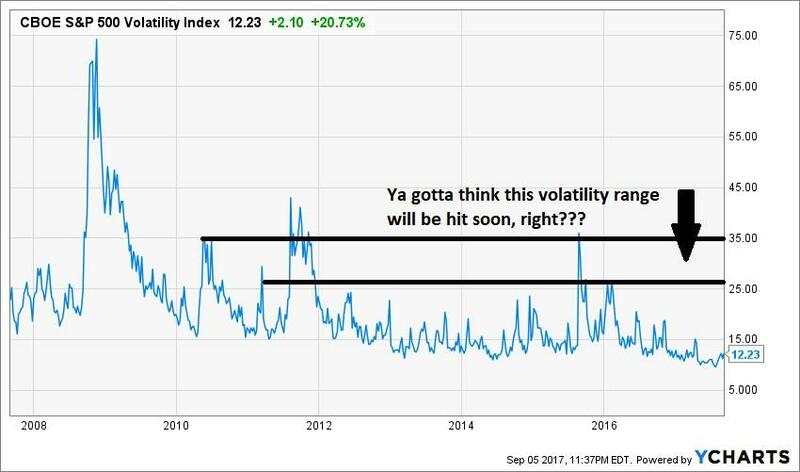 Let’s not lose our heads over volatility, the reality is that volatility is still very, very low. Will it shoot up to more “normal” fear ranges? You’d think so, but we have to remember, there’s still trillions of dollars on the sidelines. 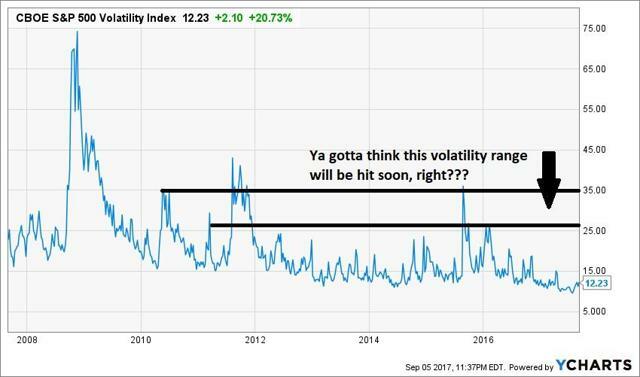 Most sell-offs will be met with buying for a long time and that’s a mitigating factor for volatility. There are many reasons that P/E multiples have drifted higher the past couple decades. Jeremy Grantham talked about it recently. If you haven’t read his thoughts, you should. Since the financial crisis, the easy money has certainly been a factor in rising multiples and a buoyant stock market. We have now entered a phase in my opinion where that money will prevent an outright crash until it’s used up. In my opinion, we’ll see a choppy market for years now. I said back on MarketWatch somewhere that the S&P 500 would eventually reach about 2700. Also told Mark Yusko in a tweet a month or two ago, maybe 3000. In other words, while the trajectory might change, we’ll still want to buy the high quality and game changing companies on pullbacks for a while. Maybe another year or two. I know folks who consider themselves traders want to trade, trade, trade, trade, but shake it off. 9 out of 10 people don’t make money trading frequently and the only vehicles for trading volatility are built for people who like Russian roulette. Any volatility now is being attributed to North Korea tensions. I’d wager a lot of it had to do with traders just needing to pay off their vacations. Real volatility will come if anything does come of North Korea, or if there is a debt ceiling issue or if President Trump vetoes some of the compromise bills I see coming from Congress – can you say DACA for tax breaks? For the life of me, I can’t figure out why anybody is getting worked up over lil’ Kim (Wild Card Draw 4) Jung-Un. He’s a pip squeak with a few WMDs, that he really can’t deliver nearly half way across the Pacific and would probably miss anything smaller than a continent. If you read a bevy of defense and geopolitical e-rags like I do, then you’d highly suspect that the U.S. has the countermeasures to intercept almost anything that lim Kim can launch in short order. We have the fastest missiles in the world joystick controlled by the best gamers in the world. We also have some sort of sonic wave gun mounted on ships that can blow stuff up. There is also the strong likelihood we have some sort of space based weapons. Oh yeah, we also have Patriot missiles. Another asset that may or may not have jumped due to North Korea were the gold miners. The Direxion Daily Gold Miners Bull 3x ETF (NUGT) also rose by about 7%. The VanEck Vectors Gold Miners ETF (GDX) has been rising for weeks though. So, what gives? While there are a couple companies I like among gold miners, the whole complex has been riddled with debt and production problems that aren’t likely to go away. Mining ETFs are designed to offer leverage on actual gold prices rising. I don’t expect gold to get expensive soon either. I’m a seller of gold miners on the rally or any other rallies. There’s just very little upside in gold or gold miners. The short story is that the oil markets have been rebalancing significantly. There is huge motivation for Russia and Saudi Arabia to see higher oil prices. As I’ve also laid out, there’s a big reasons that we could see an oil supply shock due to a conflict involving Iran in the next year or two. That all adds up to buying oil and gas investments after the recent six month sell-off. You know I like Encana (ECA) and a few others, as well as, the SPDR S&P Oil & Gas E&P ETF (XOP) and SPDR S&P Oil & Gas Equipment & Services ETF (XES). Technology has always and everywhere changed everything. I saw it as a I drove around the country and saw farms with solar fields woven in. I saw it all over. There were too many things to count that were changed, improved or destroyed by technology the past decade or two. Think about how manufacturing has really changed. Yes, corporate executives outsource jobs to get better bonuses, but something like 4 out of 5 eliminated jobs have been due to technology. The new replacement jobs have been higher tech. Change is the only constant and we need to embrace it. That’s difficult sometimes. It’s especially difficult in the midwest where people feel slighted by the east and west coasts. Nevertheless, there are huge opportunities in IoT, AR, VR, AI, EVs, and tech driven change in energy, finance and healthcare, among others. As we go forward, I will cover dozens of companies that I believe are leaders in emerging technology and companies that will impact other industries. There are ten baggers in that bunch. We’ll have to fire enough shots to find some, while maintaining a high enough margin of safety so that any losers or market performers are easily overcome by our big winners, per Peter Lynch’s famous idea. Lastly, let’s take some of our profits and remember to help people in need. With hurricane season battering the U.S. this year, there are plenty of people who need a hand. Disclosure: I am/we are long ECA, XES, XOP.